This book presents a translation of Chariot of Establishment: Treasure Trove of a Mind Absorbed in the Profound Meaning by the second Drukchen, or head of the Drukpa Kagyu school of Tibetan Buddhism. This is the first major text of Drukpa Kagyu teachings to be translated into English. The text is a compilation of over sixty different oral teachings given by the second Drukchen (1428-1476 C.E). The compiler tells us that the teachings included were selected because they establish the ultimate, non-dual view of the Kagyu tradition as it is presented by the Drukpa Kagyu. The text begins with a long teaching on the view of the Kagyu in general, making it of interest to all Kagyu followers. An important feature of this teaching is that it clearly shows the Other Emptiness (Shentong) approach which is at the root of the Kagyu view, though it does so according to the earliest teachings of the Kagyu lineage in which the name "Shentong" is not mentioned. Through it, we see how Shentong was taught oroginally in the Kagyu and we see how the Drukpa Kagyu in particular presents the Shentong view. Following this the Second Drukchen neatly teaches on establishing the view of the tantras as non-dual wisdom seen in direct perception. In doing so, he cleanly chops away the Tibetan Buddhist schools who are infamous for insisting that the emptiness of the second turning of the wheel of the sutra teaching is the ultimate non-dual view. This is a fascinating chapter because it shows a logic to establishing the view which has rarely been seen in the West to this point. The text then presents many smaller teachings on the view, always with reference to the non-dual view of Kalachakra as the ultimate way to establish the view. Thus, the book also contains many teachings on tantra in general as well as many interesting points from the Kalachakra. One chapter has a fascinating presentation which shows the meaning of Kalacakra, claiming that the commonplace translation of Kalachakra as "Wheel of Time" is mistaken. 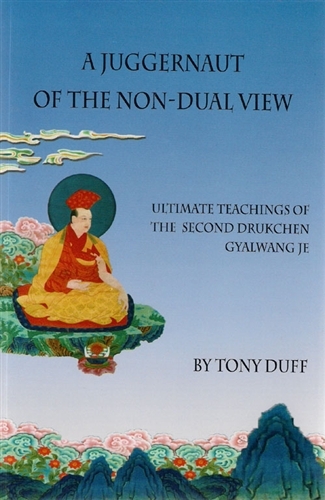 A long introduction by Tony Duff gives a history of the lineage, a guide to the Shentong view and how it is presented in the various Kagyu schools and clarification is also given on the meaning of the chapters on the view. The book will be of great interest to Drukpa Kagyu followers. However, it should also be of great interest to a wider audience because it shows how Kagyus express the ultimate, non-dual view and how the practice of tantra is the ultimate approach to the Buddha's teaching.